The La Plage campsite in Marseillan provides a choice of services for your comfort to ensure that your stay with us is as enjoyable as possible. In an exceptional setting by the sea, with direct access from the campsite and the beach. 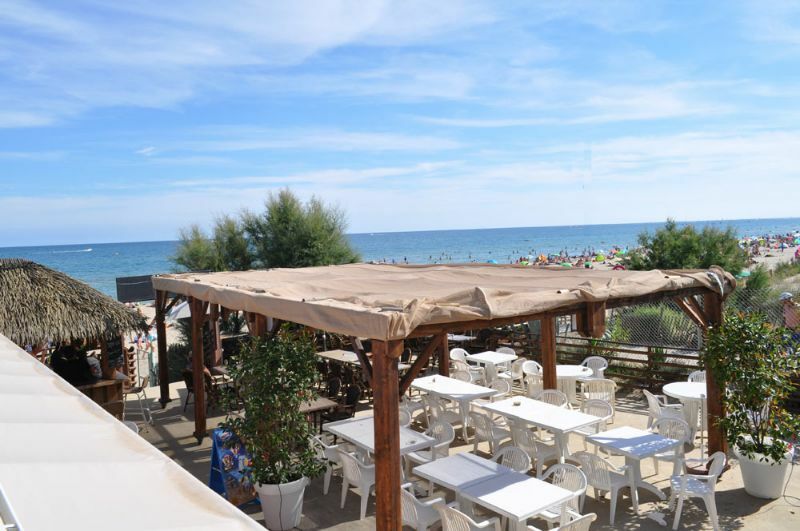 Savour the delicious choice of fish, meat, shell-fish, salads or pizzas or just quench your thirst or enjoy an ice-cream while admiring the view of the sea in the les Pieds dans l'Ô restaurant. Our reception staff are at your service every day to help you and guide you. They will provide you with details of cultural or sporting pursuits and other activities. Ask at Reception for an Internet WiFi access ticket. In the reception area from 8:30 am to 9:00 am. The campsite has a play area for children, with toboggan, swings and climbing frame. There is also a table tennis table for all ages. An individual safe can be rented for your personal jewellery and valuables. A service area is provided for motor homes, where you can drain grey water and fill up with water.